Posted December 4th, 2016 by Mike Boyes & filed under Child Development, Families and Peers, General Psychology, Human Development, Interpersonal Attraction Close Relationships, Moral Development, Social Psychology. 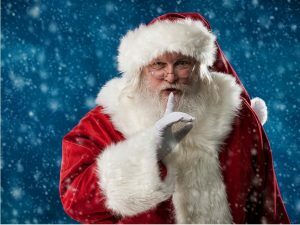 Description: Okay, at the risk of once more convincing people that academics have particular talents for taking all the mystery and fun out of life, let me ask you to consider the important question of whether parents should continue to lie to their young children about the reality of good old Santa Claus. Even if you have a strong belief on the subject pause for a minute and think about the possible implications of situations where parents over a number of years consistently stick to a position or story with their child that will eventually, inevitably, turn out to be untrue. Oh and before you read the article linked below please remember not to blame the messenger (me!). As a development psychologist I have never been particularly concerned about parents participating in cultural myths and adventures with their children. It sometimes seems like psychologists or psychiatrists dumping on the Santa myth are actually almost as Christmassy as eggnog (albeit more naughty than nice). Source: Don’t tell children Father Christmas is real because lying to children could damage them, warn experts: The idea of “terrifying” North Pole intelligence company was also condemned to academics, John van Radowitz, Independent.co.uk. I typically try not to directly offer my own professional views in these postings. However, in relation to things like Santa Claus, the tooth fairy, the Easter Bunny, and other bits of sociocultural fun I feel compelled to point out that they are very likely are some important differences between situations where parents blatantly lie to their children about important life facts and situations where parents and their children jointly participate in shared seasonal cultural events involving stories, myths and characters like Santa Claus. If such activities consistently produced relationship risk we would be a lot more trouble than we seem to be already. As always however, before you form your own opinion on this subject, please seek out what might be available in the way of solid scientific data before settling on an opinion or perspective. How did you find out about the relationship between Santa and reality (and I hope I shouldn’t of had to start this sentence with “spoiler alert”)? What are your views on the contention of the psychiatrists quoted in the article linked above that parents playing along with the Santa myth involves them categorically lying to their children in ways similar to almost any other lie you can think of? If some version of your response to the question above involves a statement about there being some sort of difference between the two situations noted, what is the nature of that difference in are there other examples we could look at or conduct research upon to try and sort them out? Boyle, C., & McKay, K. (2016). A wonderful lie. The Lancet Psychiatry, 3(12), 1110-1111. Breen, L. (2004). What if Santa died?. The Psychiatrist, 28(12), 455-456. Highfield, M. E. (2011). “Here Comes Santa Claus”: What Is the Evidence?. Advanced emergency nursing journal, 33(4), 354-358. Cluley, R. (2011). The organization of Santa: fetishism, ambivalence and narcissism. Organization, 18(6), 779-794. Vines, G. (2007). The Santa delusion. New Scientist, 196(2635), 36-37. Stronach, I., & Hodkinson, A. (2011). Towards a Theory of Santa: Or, the Ghost of Christmas Present (Respond to this article at http://www. therai. org. uk/at/debate). Anthropology Today, 27(6), 15-19.